My plants came back from summer camp in the nick of time. Since the first of May they have been on the screened-in porch having fun and providing homes for the many tiny spiders and that was all great – until last week went the painters showed up. I saw then that even if they hadn’t gotten unceremoniously lifted and toted inside with the arrival of the ladders and the paint buckets, their days out there were numbered. I mean it was going to be in the 30s last night – too cold for their little membranous parts. And luckily we haven’t turned the heat on yet so they won’t feel shocked by the dry choking air the furnace pumps out. The time was right, and I knew it. People mostly do know when the time has come for an ending. 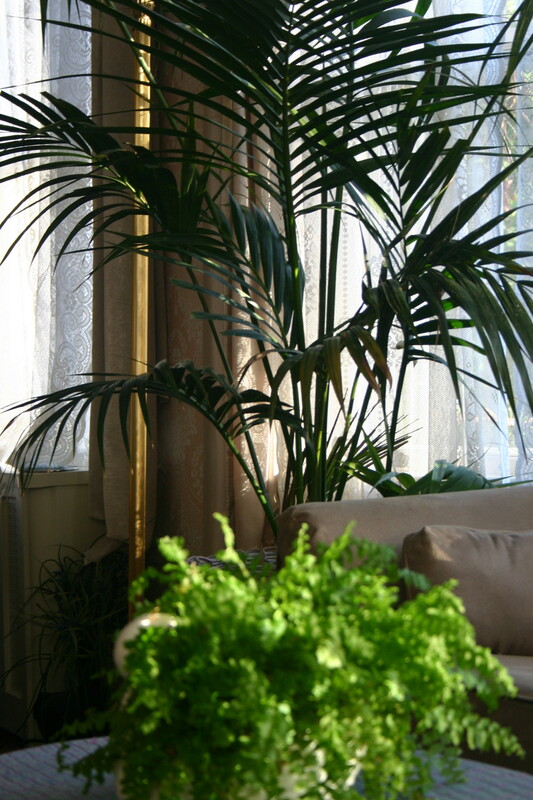 So I sat down with each plant and sorted through its petticoats, cleaning away spider webs and dust. 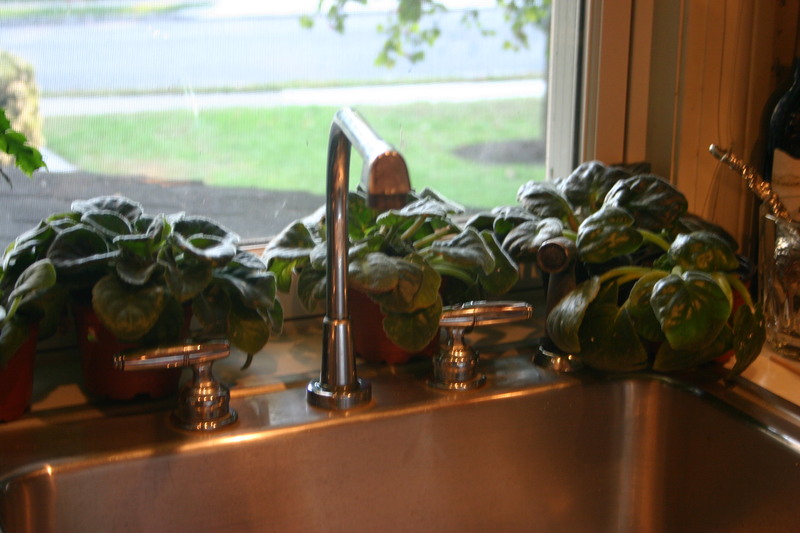 I watered and misted each one and let it tell me what corner of the house it wanted to be in. ….Well the violets keep their own counsel. Sometimes they blossom and sometimes they don’t. They’re like kids in Middle School the way they only one to hang with each other and one will only do what the others do. I’ve had my share of gardenias this year but they’re ready for bed bow I sense. 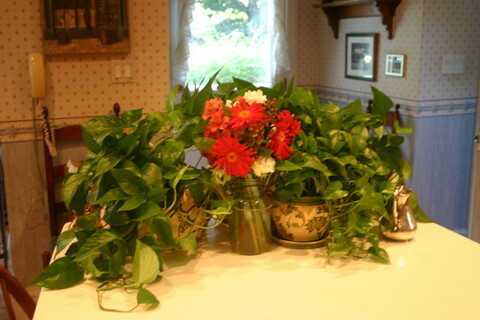 I do buy cut flowers at the store when the price is right and they’re pretty while they last but if you want a plant with good foliage that looks like a million bucks year after year go with that tough customer the pothos. Big or little hanging or climbing, a pothos will gladden your heart on the day rain drums on the windows; and on a sunny day like this? Garden of Eden, baby. Garden of Eden. The sun is just coming up as I write this and it looks to be another gorgeous autumn day for those of us above the grass here. So let’s all enjoy it! How nicely balanced this scene is. Inviting. A gateway to the contemplative dimension, poetic and open to serene reflection. Much like the lady who dwells here. Like a wise cat who knows the best of places to recline, here, I think, you would find me with a good book-hard pressed to move. Unless of course, someone called for supper. Beautiful. Guess we know who has a green thumb. Beautiful! Yes, I agree with all of the above. And your plants look so happy. 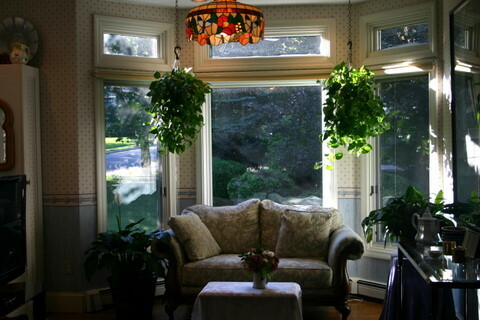 I have a small sunroom, AKA The Jungle Room, where hanging plants thrive, as do those on the lower level. However, they are dangerous, to the point of grabbing at my hair and jabbing me in the face. I always forgive them for their various sins of commission, for I love all that greenery and sometime floralry, especially when winter winds blow. I take my coffee out there on a snowy morning, and later I might read a book when my household chores are over. My brother counted 50 plants, but that includes all those in the rest of the house.